My Culinary Journey for 2015 kicks off with a sweet treat. I have been so fortunate to have travelled a bit in 2014 and was introduced to so many new and wonderful dishes. I promised myself that I would return back home to South Africa, and give these new dishes, at least “new” to my tastebuds 😉 , a try out. I am enjoying this new “challenge”, and hoping that you all join me as I share with you my, Travel Inspired, recipes that I have throughly enjoyed working on. Now Chocolate Mousse is MY all time favourite dessert. But while in DUBAI, BAHRAIN and even while cruising thousands of miles high above ground, aboard Etihad Airlines , my tastebuds were treated to a light and airy, fruity Mango Mousse. I loved the fresh and light taste of this mousse, and you bet that was the 1st culinary challenge I set myself up for. And all I can say is…Challenge Conquered !!! Here I have teamed up Mango with Orange , as these fruit are in abundance now in South Africa. However the dessert may be made with just Mango alone. It’s a quick and easy dessert and well worth a try, especially in these warm weather conditions. The best type of Mangoes for this dessert, are the large, string-less variety, as shown in picture below. ~ Add the Orange juice, zest, 1 Tablespoon castor sugar and falooda powder into a saucepan and warm slightly until sugar and falooda powder are dissolved. ~Peel and Cut the mangoes into cubes or pieces (save a few slivers for decorating ), and blend together with the liquid from above. ~ Whip the Fresh Cream, and slowly add in the rest of the castor sugar, until a stiff consistency is reached. ~ Whip in 1/2 the mango pulp into whipped fresh cream, using the whisk attachment you used for whipping. ~Now gently fold in the rest of the pulp, with a spatula, until well combined. ~Topple the mousse into a Large Serving dish or Individual serving glasses. ~ Allow to set in the refrigerator for 3 -4 hours or longer , and decorate only just before serving. * (Today I decided to use a Starwberry Coulis and Chocolate Sauce, together with the mango slivers I saved earlier and a mint leaf). ** for a firmer set mousse, increase the amount of Gelatin/Falooda Powder slighlty. Whether you call it Maleeda, Maleedo or Malida , this delicious sweet treat, is a favourite among many Muslim households. 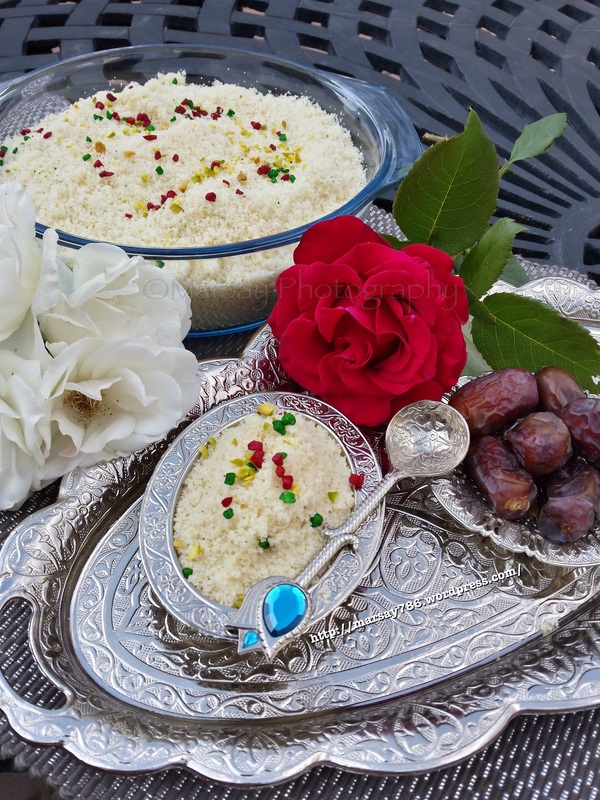 Be it if prepared for a certain Month in the Islamic Calender, or as part of sweet dish to serve at a special event, Malida has most definitely been around for eons it seems. Upon researching more about Malida, I was amazed to find out that its actual Origin had been Afghanistan, and here I thought it was a soley “Indian” type of dish. I remember fondly, growing up in Durban, and being the little Eager Beaver?, helping out My Dadee , Mummy and Aunts in the kitchen, and how making Malida had taken up a good half of a day. Dadee (My Dads’ Mum) was from a very old school of thought, and we had to make Malida like she had been thought. Laborious to say the least, but those were such precious times and I am most grateful for all the guidance from all the women Role Models in my family??? So back to the recipe, that now takes me about an Hour to whip up, from beginning to end?. Hoping some of you do give the recipe a try and would love some feedback in the comments section below. 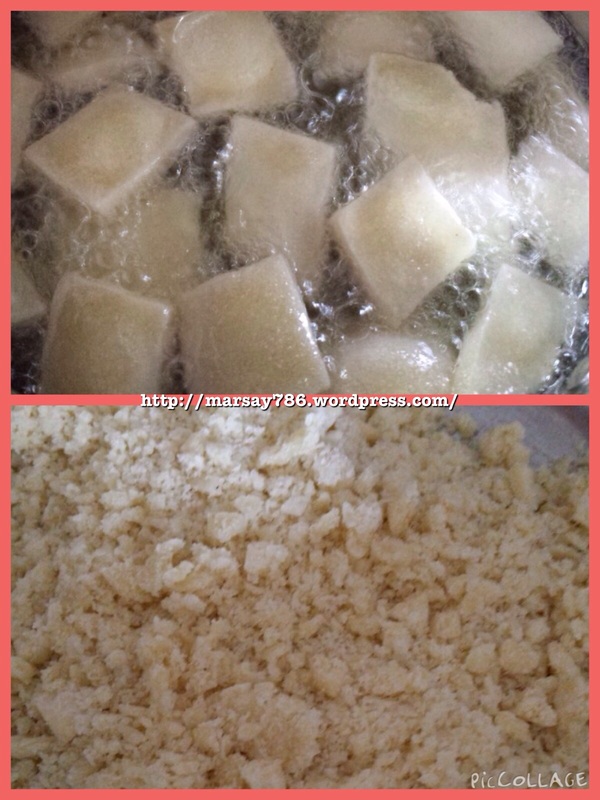 ~Rub butter into the Flour and Semolina mix. ~Make a dough with the milk, adding gradually. 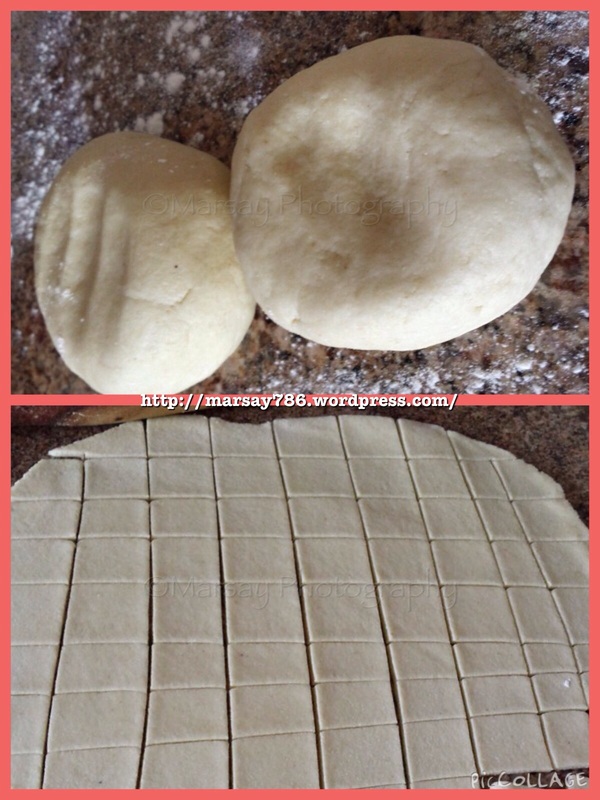 ~Roll out dough and cut into small squares/diamonds, refer to 1st pic below. ~fry the dough in shallow/medium oil until light rosy to brown colour. ~once all the “cookies” are fried and are cool enough to touch, break them apart using your hands, no need to be particular at this stage, just crumble them small enough to fit into your Coffee Grinder. Refer to 2nd pic above. ~Grind small batches of this crumbled dough, in your Coffee Grinder, until fine. When all the “cookies” are finely ground, add the following to it and mix through well. ~2 Tablspoon of melted Butter. That’s it, your Malida is now ready to be enjoyed whatever the occassion may be, or with just a great cuppa warm beverage? How many of You, Like myself, would dread making a Pizza from scratch? Or at least the Pizza dough bit? For years now, even as I learnt while growing up, there was always an array of ingredients to throw together…. Butter, oil, flour, milk, seasoning, some even called for an egg….tedious even if just looking at the ingredients to begin with? My luck turned for the better that day, a good few months ago, while browsing through one of my social media sites, and I had come across a recipe that requires nothing more than 2 Ingredients for the pizza dough??? Well I finally did give that recipe a try, wondering if it were even possible with just 2 Ingredients. And all I can say is…Where on Earth has “LIFE HACKS” been all my life? 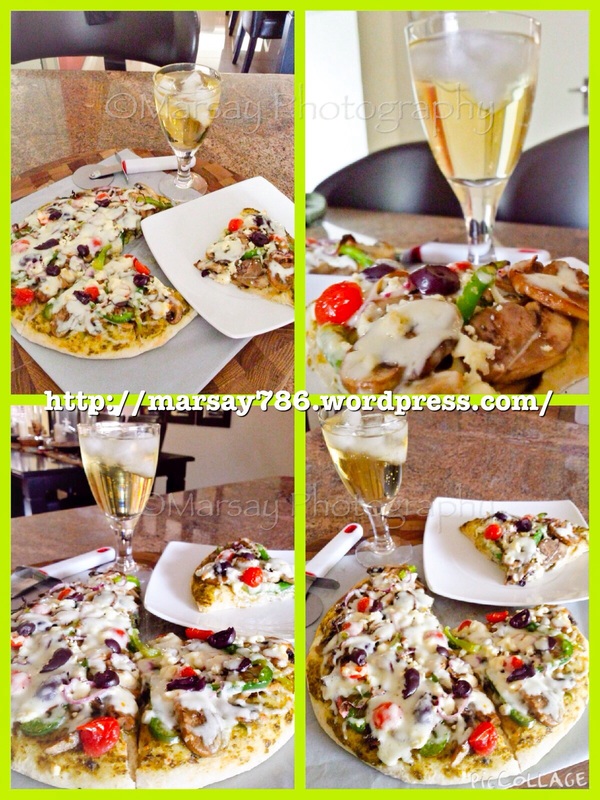 it is The most simplest and most delicious pizza base, and my topping off course?, and I most definitely won’t be making any other tedious methods hereafter…enough said, here is the recipe for the dough, in pic form, as I had found it, with the dough I made at the bottom?. ✏I did add a bit of salt, pepper and Italian herbs(Dried) to my flour. ✏Knead with hands and use more flour for dusting as you go. ✏ I added yoghurt a little at a time until I achieved the desired dough consistency. ~press pizza dough onto a pizza plate, may be rolled out to your liking, I wanted a thicker base so opted to just press out the dough. ~spread 1 Tablespoon of any variety Pesto (I used a Coriander Jalapeno and Macadamia pesto), onto dough. 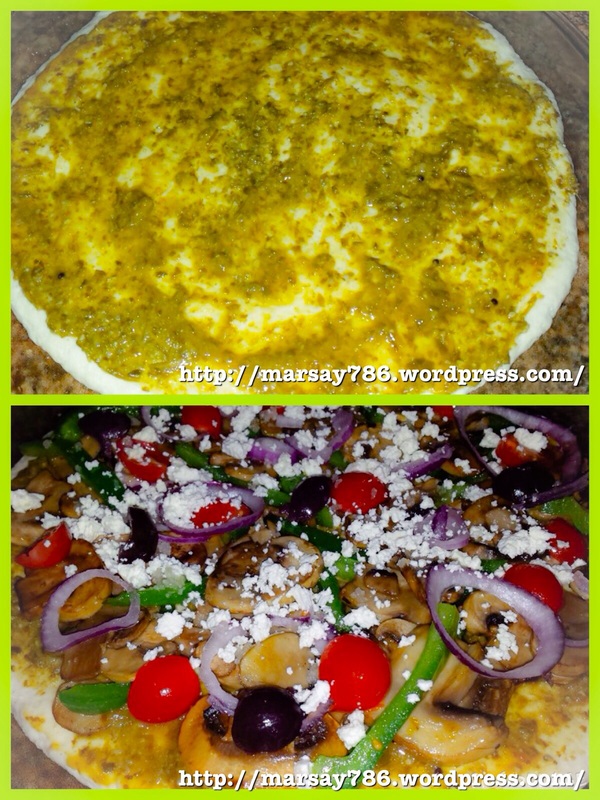 ~Bake the pesto topped dough in a moderate oven for 5 mins, enough time to get the rest of the topping ready. ~slice a few rings of Red onions, half some cherry tomatoes and slice black olives into rounds and crumble 1/4 round of feta cheese. ~ after topping the pizza, return back to oven and bake for 15mins or until dough is just browned through. If making a thinner base, baking times may vary, bake until as crispy as you prefer. ~5 minutes before finishing, remove pizza and top with grated mozzarella cheese, return to oven until cheese is melted and dough is done. Now your pizza is ready to tuck into….yummmmm!!! Life is Too Short…Enjoy a?MockTail or Two? There are some things in Life that need no reason to express yourself, but then again, it could mean the World to someone else. A simple Smile, a kind word or two . There’s times when a simple Gesture, like preparing a drink or meal could just blow the other person away. I have been privileged to have a few of the latter experiences in my short 14 years of Marriage to my soul mate and Best Friend, Imran. And let me tell you, if you haven’t experienced this feeling before, it’s such a small gesture, we all take for granted in our everyday life, and by just doing a simple role reversal, can increase the love and appreciation you and life partner share?. And Ladies, as much as we hate letting our Better Half into “our space”, the kitchen, you just may be surprised by what amazing results come forth from their kitchen experiments?. On one such occasion, having a weekly meet-up with my girlfriends, Imran kindly suggested that morning , “Babe, don’t worry about supper today, I will prepare us a Braai. (Braai is a South African terminology for Barbeque?). Yeah Ladies , we all know, even if it’s a Braai we women are still caught up other basic preps, like salads and other side dishes. But on this day, all I had been instructed to do was, “only take out the meat”. To cut to the Chase, I warily agreed, thinking I’d still have to return from my get together and do all those extra preps, but was I pleasantly surprised. Everything was well taken care off, oooh and my kitchen hadn’t been blown up?, rather I was the one Blown Away. Supper à la Imran was served. Succulent and Juicy Braaied Lamb Cuts and Chicken Fillets,just the way I like it. Side dishes were Baked Potatoes and Stuffed Roasted Whole Peppers. All of which I had mindlessly forgotten to click a picture of, in my excitement?. But the King of the Show for me, had to be the Mocktail (non alcoholic drink made with fruit juices and sodas) Passion Fruit Mojito, once again à la Imran . I did manage to get pictures of these though, before we both thirstily sipped them down. Here is Imrans’ recipe he happily shared with me, so all my followers/family/friends could pass it on to their hubbys’/better half, so you too could enjoy this experience like I most definitely did??. Looking forward to your responses, in the comments section, if you do give this recipe a try? all that’s left to do, is rise your glass, and ENJOY with your Life Partner? Siblings…. As I sit here blogging, I Can’t help but reminisce of all the good times we had growing up. Whatever had us siblings having those little niggly quarrels growing up, is now in adulthood all banished to the furthest memories, opening up to what can be best termed as friends for life now. My blog today is related to my youngest sister, Humarah, who when growing up had always looked up to our eldest sister, and I hope myself?, and here we are today, grateful that they have both given me the opportunity to be the “Worlds Best Aunty” to my adoring nephews and nieces. It is during one of my “Off Days” when you just become blank as to what to whip up for dinner, when she comes to my rescue, sharing her doting in laws recipe that she has mastered. Now with her permission, I will share on this delectable recipe that will have you returning to it time and again, for a Quick and Easy Chicken Roast. whisk above ingredients to make the marinade. ~remove foil, turn chicken pieces and veggies once and bake for a further 10 minutes or until done. ENJOY!!! Serve with a crisp salad and rolls.